Thermostatic Mixing Valves are designed especially for being used at a single unit, wash hand basins, bathtubs and showers. Thermostatic Mixing Valves are mainly used within the Health Care, School and Residential Care services sector in order to maintain temperature without the risk of scalding. Thermostatic mixing valve is a valve used for maintaining water temperature by blending cold and hot water together in constant flow to ensure safety while washing hands, taking shower and / or bathing. Designed for maintaining water temperatures, these thermostatic mixing valves main purpose is to prevent scalding due to the hot water burns in elderly, young and vulrnerable people. The mechanism of Thermostatic Mixing Valves is a basic wax thermostatic principle which limits the quantity of hot water and cold water by blending. Also, if the temperature rises above the requirement point then the mixing valves automatically shuts down thus preventing extra hot water to flow through the pipe. There are four components that make up a Thermostatic Mixing Valve. These thermostatic elements are the temperature sensitive elements which contracts and expand in relation to the water temperature. Whenever there is the sense of change in temperature inside the valve, it moves its piston up or down in order. This movement of piston changes the proportion of hot water and cold water in the valve. The movement of piston is vital in a thermostatic element as it shuts off rapidly in case the regulation of water fails. The movement of piston is vital in a thermostatic element as it moves according to the thermostatic element’s sensor. It prevents scalding by shutting off rapidly in case the regulation of the hot and cold water fails. Return Spring is the component in thermostatic mixing valve that functions by pushing the piston back to its normal position after the contraction or expansion of the piston due to the change in water temperature. This adjuster as name denotes is kept under the shield lock of the valve and has the ability to adjust the temperature in the valve. Basically the adjuster adjusts the position of piston thus adjusting the proper quantity of hot and cold water in the valve. These were the components of a Mechanical Thermostatic mixing valves. There are digital Thermostatic Mixing Valves which have slightly different approach in cooling water. The Digital Thermostats are controlled by the sensors present in the mixer. 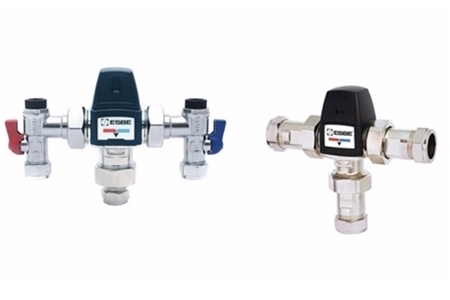 The Digital Thermostatic Mixing Valve has the sensor which can be turned on and off manually or in auto mode with advantages of a timer setting. The UK Government is clear on the standard maintenance matter that the Thermostatic mixing valves are to be maintained as per to the standard required by the Law for the safety, hygiene and controlling of Legionella. Is Accreditation of Thermostatic Mixing Valve Necessary? Too Date there hasn’t been a process for accreditation to undergo for the Thermostatic Mixing Valve. Be sure to have a competent person during the installation. This will help in proper adjustment of the TMV. Muilding regulations for domestic property has clearly mentioned that the normal new households or materially changed households bathroom should not exceed maximum temperature of 48 C.
Water temperature around 60 C will severely burn the skins within five seconds of young children. Also the exposure to the water temperature of 49 C (which is common in most household) can cause a serious burning injury within two minutes. The UK government has also stated that the use of Thermostatic Mixing Valve which meet up to the standard have to be used in the care homes and schools. So, for safety purpose the maximum temperature can be set up to 41 degree or less in the Thermostatic Mixing Valve. Thermostatic Mixing Valves for Office, is it Necessary? It is not mandatory to use Thermostatic Mixing Valves in the office or households by landlords but proper risk assessment should be done in order to prevent unseen accidents. Can I Maintain it and Service it Myself? Experts advise to check your Thermostatic Mixing valves once a year for safety assurance by comparing it with an original set temperature. Testing should be done properly to assess the full functioning of the Thermostatic Mixing Valves. Checking and measuring the quantity of mixed water temperature in the outlet in order to know whether the piston mechanism is up and running. Isolate the cold water supply in the valve for about 5 seconds, and if the water is still flowing be sure to check if the temperature is 49 C or the manually set temperature. This allows the user to check the fail-safe shut off function of the Thermostatic Mixing Valve. Checking of (fail-safe shut off) function is necessary as a last resort in preventing scalding. The Thermostatic Mixing Valves can get wear off due to various reasons with hard water is one of the factors that wear off the valves. And also the frequency of use determines the life span of the Thermostatic Mixing Valves. Experts advise that the first servicing of the Thermostatic Mixing valves should be done within running of the valve after 6-8 weeks of its commissioning. After that the valve test should be done frequently there is a reasonable amount of doubt in mixed water temperature. Depending on the water temperature the second or third servicing can be done after 18 to 30 weeks of first servicing. In general practice, usually TMVs are fitted close to tap or shower. 1. The activity in one or more outlet must not hamper the activity in any other outlet. 2. If a single valve is to be activated for supplying mixed water in more than one outlet then the pipe length and volume of mixed water should be at minimum. Generally the Thermostatic Mixing Valves are genuine, stable and well built. The life span of Thermostatic Mixing Valves relies on various factors. The installation process, conditions in which they are operated should be equally emphasized too. Furthermore, the user’s behavior along with the quality and the servicing frequency also makes significant difference in its life span. Other factors such as hardness of water, arsenic water, alkalinity presence also have negative effect on the Thermostatic Mixing Valve. These elements have massive impact on the corrosion in Thermostatic Mixing Valve. Can TMVS be set to a low temperature? Is there any effect if the set temperature is high? There has been many physical as well as mental effects seen in the children and elder people due to high temperature set in Thermostatic Mixing Valves. The elderly when exposed to high temperature in Thermostatic Mixing Valves have been found to have prolonged hospitalization. In case of children the exposing of high temperatures results in lifelong scalds along with traumatic experience. Whenever a user suddenly changes water temperature directly from cold to hot, it results in temporary increase of seven degree Celsius. It then supplies water at a high temperature than the prescribed maximum. Therefore, users are not advised to make sudden changes in temperature control while using shower. Do the non-return valves cause the temperature control system to fail? If the main pressure and the pressure from water with high temperature differs then the water with high temperature is forced back. The high temperature water then goes down the pipe through a one sided valve (which blocks the other side). This results in failure of maintaining the water temperature desired by the user. However, an open vented system localizes expansion from the water heater. So, the contamination and a result of bad plumbing or incorrect plumbing can cause the failure in temperature control system. Proper installation and maintenance are also important in order to protect the filtration measures. The checking on the product are also needed for correct performance. Initial phase is the most important phase in every case. So, here while installing the Thermostatic Mixing valve various factors are to be considered so that there won’t be any future issues. Sometimes the flow of regulators are stopped or jammed. It is due to the damp winter season which causes this sort of trouble. This will often show up in winter season so servicing within 6-8 weeks of commissioning is necessary. While installing it is necessary to check the manuals and instructions that come with the package. And even after it doesn’t work out as you planned it to be, then The best thing one can do in order to get his/her TMV working is getting assistance from the manufacturer.